Representative Council is the policy-making body of TALB. 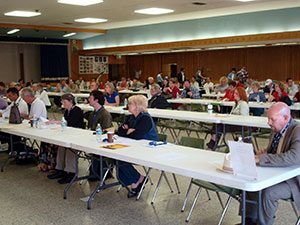 Members at every school site can elect Association Representatives (also known as Site Reps) to represent their interests at the monthly Rep Council meetings. The Rep Council approves all TALB policies, adopts an annual budget, approves member dues structure, and can decide political positions for the Association. The Rep Council also discusses relevant issues that members are experiencing at the various school sites. Every school can elect 1 Site Rep for every 15 members (or major fraction thereof) at that school site. For example, a school site with 37 members can elect 2 Site Reps, each with a vote at the Rep Council meeting. A school site with 38 members can elect 3 Site Reps. The Site Rep is the direct link between the members and the rest of the Association. In addition to voting at Rep Council, Site Reps distribute important information to the members at their site. Site Reps can also relay questions and concerns to TALB staff, the Rep Council, or to TALB Board of Directors. Site Reps may assist members during meetings with the principal or administrator. Site Reps help to keep member contact records current at the TALB office. They help to organize volunteers and they facilitate elections. K-12 Rep Council meetings are held monthly from August through May. Child Development Center (CDC) and Head Start teachers also meet informally to discuss issues at their sites with the TALB President, the CDC/Head Start Chairperson (TALB Board member), and TALB staff. Dinner is served at 5:30pm and the meeting starts at 6:00pm. These meetings are held at the TALB office, 4362 Atlantic Avenue, Long Beach, CA 90807 four times during the school year.